A couple star parties have been rained or clouded out so far this year! Will April bring clear skies? Let's hope so. Nobody buy any equipment right now! Our next star party is at our dark-sky site, GMARS. Dress warm and join us as we take in the night sky and the objects of the spring constellations. GMARS star parties start Friday afternoon/evening and wrap up on Sunday morning. Be sure to join us for the potluck Star-B-Q on Saturday afternoon (roughly 60-90 minutes before sun down). We provide the dogs, burgers and fixings. You provide a sidedish, dessert or beverages (if you want to)! Snowmageddon 2019! 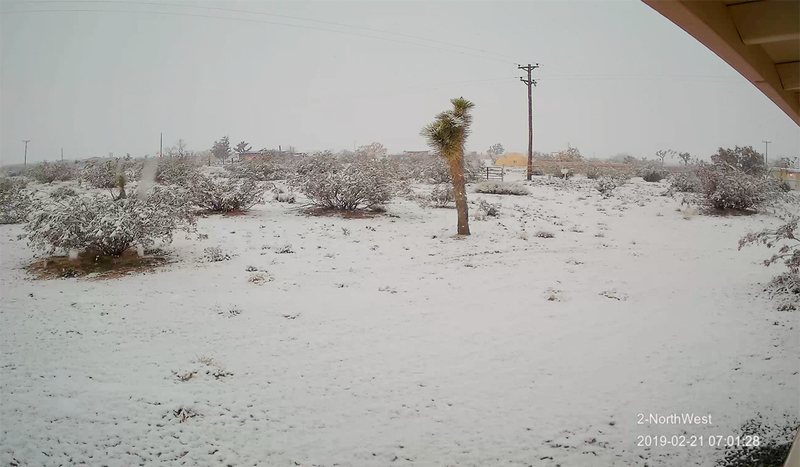 GMARS experienced a fairly significant (for the California desert) snow event on February 21st! Landers and surrounding areas were blanketed with snow in the early morning hours. Click the image for a larger version. Ask the Outreach Director to add an event to the calendar. View larger calendar.